As my blog name implies, if there is a project I can’t figure out on my own, I run to Google or Pinterest for help. I found lots of helpful tutorials for embroidery stitches online, including this series by Rocksea (links on the right). 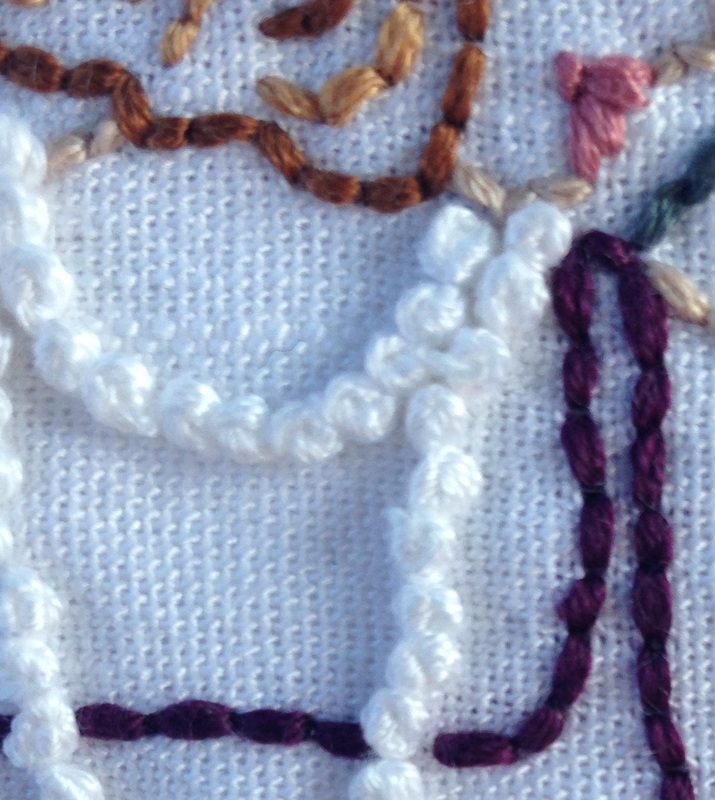 From the embroidery piece, place the floss over your needle. Continue to pull it under the needle then back up toward the needle tip. Loop the floss around the tip of the needle. 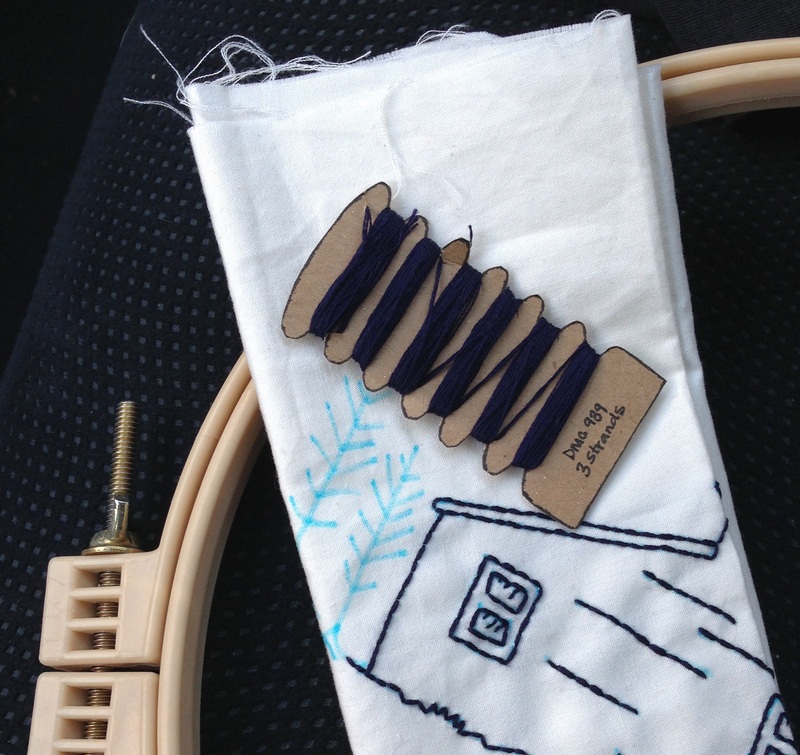 Put your needle back into your embroidery piece a few strands away from where the floss came out of the fabric. I like to pull the floss until the knot is up against the needle (instead of in the middle of the strand of floss), then press my thumb gently against the needle to prevent the knot from moving up the strand of floss. 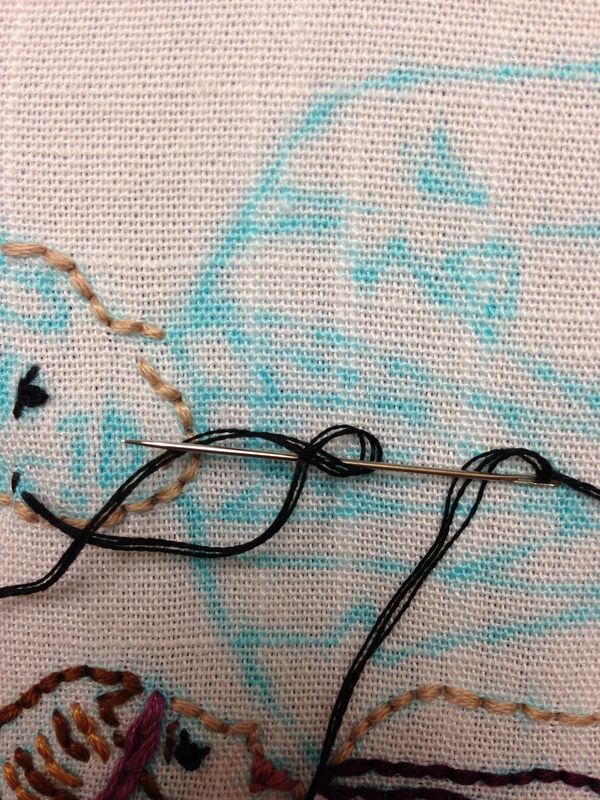 Otherwise, you can end up with a knot in your thread instead of where the knot is intended to be. Now that I am finished with my Gatsby embroidery (I’ve seen the movie, and thank goodness I still like the book! ), I have been working again on my Barn Quilt. I used the full six strands for the Gatsby piece, but I am using only three strands for the Barn Quilt. Each slot is smaller than a typical embroidery floss bobbin, both because there are fewer strands and because the length is much shorter. The cards have been working great so far! Categories: Embroidery | Tags: 3 strands vs 6 strands, colonial knot, colonial knot tutorial, colonial knots, drawing, embroider, embroidery, embroidery floss, embroidery floss bobbin, embroidery floss card, floss bobbin, floss card, french knot, french knots, how to embroider a colonial knot, how to make a colonial knot, how to make embroidery floss bobbins, how to tie a colonial knot, making a colonial knot, making embroidery floss bobbins, multi floss bobbin, multi strand bobbin, multiple floss bobbin, photo, photograph, picture, primer, six floss bobbin, six strands of embroidery floss, sketch, three floss bobbin, three strands of embroidery floss, three strands versus six strands, tutorial, tying a colonial knot | Permalink.